Writing this while waiting at the airport for my flight to Stockholm. There was no time for this before although the event already ended on Saturday morning. On the last day of the OUGN Spring Seminar, I attended again Jonathan Lewis with his presentation about “Key Features of Redo”. He started with a great introduction into the Oracle Database Architecture, followed by a deeper dive into Redo. Some of the technical details are here, while almost everything about the presentation can be found in the second chapter of his new book. 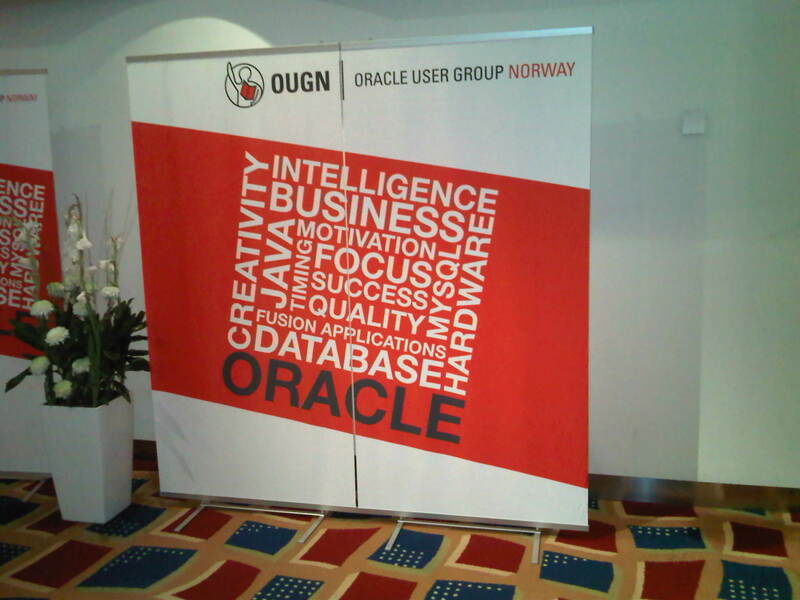 In summary, I was very pleased with the whole event: Great job, OUGN! We are actually now on the cruise ship! I am not going to put any pictures into this posting, because the WLAN here is very slow and the upload would take forever therefore. 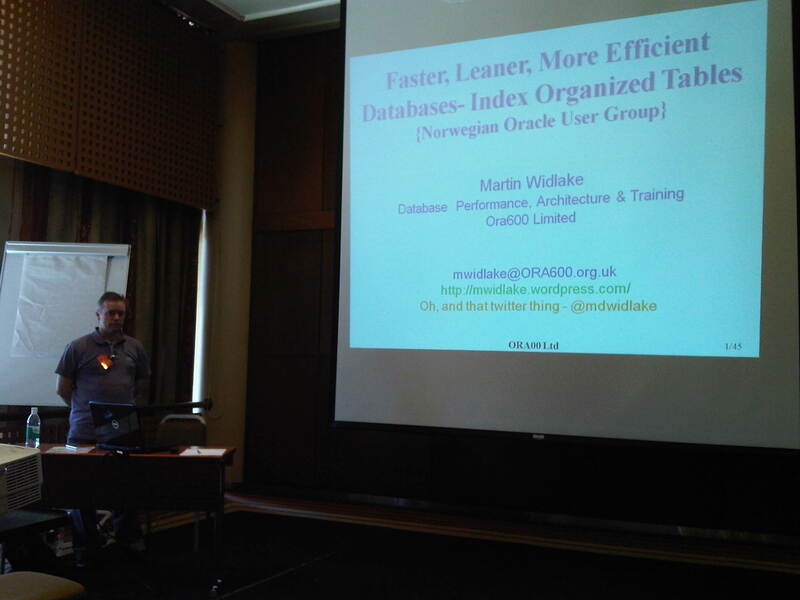 The first session I attended today was held by Jonathan Lewis about “Design Optimal SQL”. 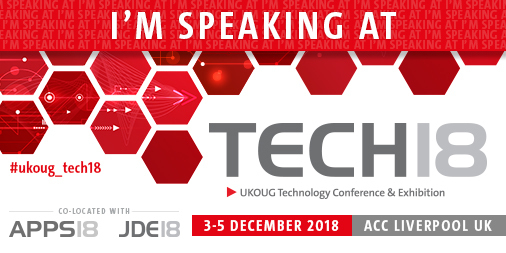 It was very interesting and well presented – almost the whole presentation is here. SQL Plan Baselines are very useful and easy to implement. After an upgrade to 11g, typically a few statements will show a degraded performance. These get the most attention although the majority of statements stays with the same performance or improves. Collecting SQL Plan Baselines on Test Systems and deploying them (via staging tables) to Production Systems works very well and “we do it all the time”. Setting of OPTIMIZER_FEATURES_ENABLE=10.2.0.4 indeed returned the optimizer behavior of the previous release – that is in line with Maria’s claim yesterday about that parameter. Now collecting SQL Plan Baselines for these statements will first only allow the good old 10g plans with the chance to get new better plans evolved later. Evolvement is not as much in the focus for customers than Plan Stability. Speaking at the OUGN Spring Seminar 2012, this gives me the great opportunity to attend the other speakers presentations. 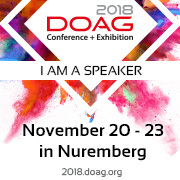 I’d like to post what I took with me from there – this is by no means comprehensive – because it might be of interest for the Oracle Community. 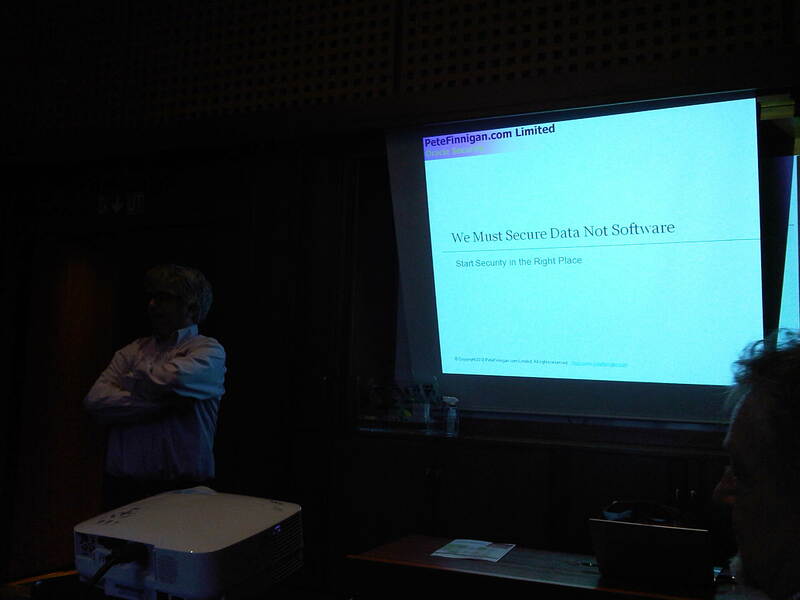 The first presentation I attended was done by Pete Finnigan: “We must secure Data not Software”. He said that the state of affairs regarding security has only slightly improved during the last decade. According to Pete, Press and Blogs focus too much on hacking (e.g. SQL Injection) while the main security thread is company staff that has (too much and too high) privileges. His main advice: “Stop people connecting to the Database!” Directly, that means, instead via an application server. Also our focus as DBAs is too narrow on hardening the Database instead of implementing Security Policies. So while hardening is valuable, it is not enough and will not protect the sensitive data from being accessed by internal staff. 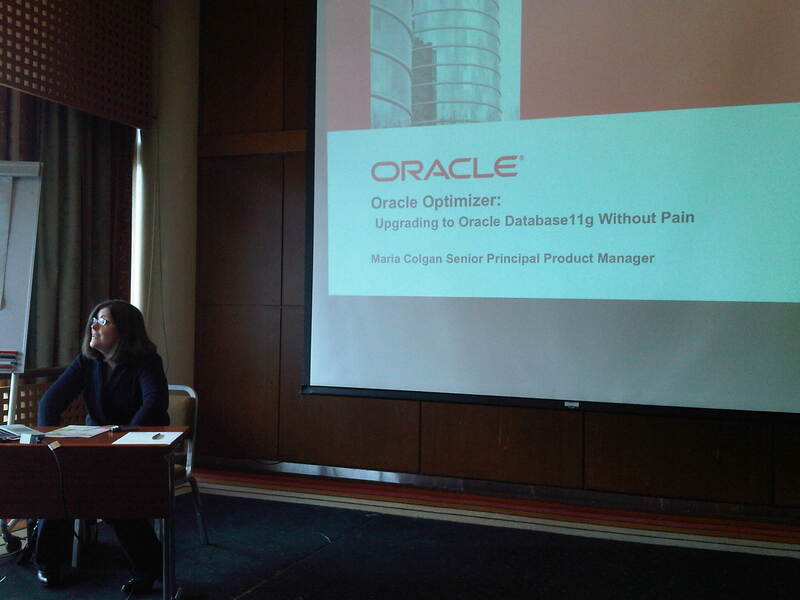 The behavior behind the parameter OPTIMIZER_FEATURES_ENABLE has very much improved in 11g compared to 10g, because Oracle Development hast put much effort into it. Consequently, when set to 10g, it will really produce the 10g execution plans although you run an 11g DB. After an upgrade to 11g, valid hints will still be followed – but chances are that the rest of the hinted statement will be executed different in 11g. In other words: Hints alone don’t produce Plan Stability unless you hint each and every aspect – but who does that? Run 11g on a test system with your production statements (captured with SQL Tuning Sets, e.g.) with the parameter _OPTIMIZER_IGNORE_HINTS=true and try to remove as many hints as possible from production, because often performance will improve. After an upgrade to 11g, run with the 10g optimizer statistics first (a week, e.g.) before you collect new statistics. Use pending statistics first to be on the safe side. VPD policies and function should be created in different schemas (not the application user schema), to hide their content from views like ALL_POLICIES that would otherwise be exposed to the application user. Think about all the location of sensitive data: Not only tables but also Backups, Datafiles, export dumps, Block dumps etc. IOT access compares especially favorably to Index Range Scans regarding the number of Block visits.